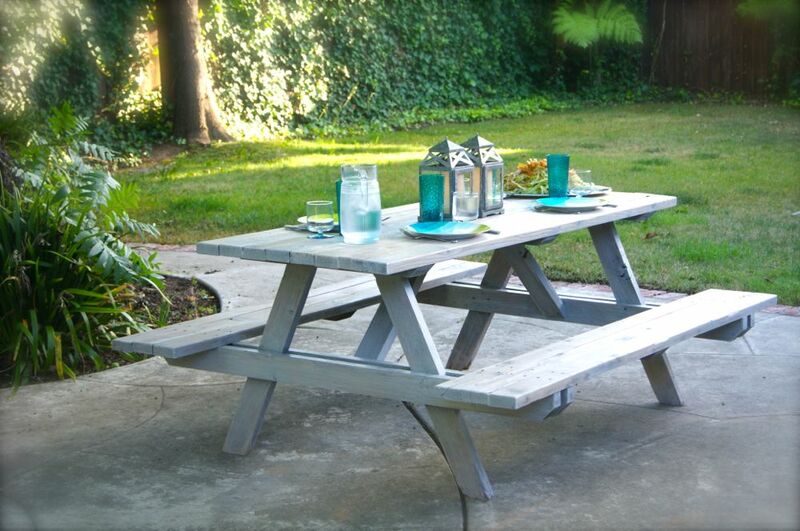 Back in May I asked you to give me color advice on the picnic table I found for free in our neighborhood. After a bit of debate we decided against a bright color and went with a neutral gray. 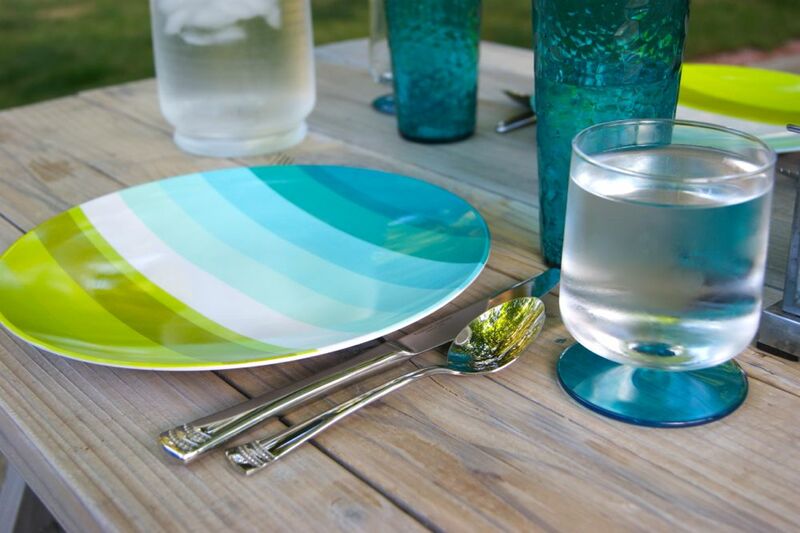 I love bright colors and using paint but I didn’t want to deal with it chipping and cracking. Sorry for the delay in these reveal photos, I was going to post them weeks ago but I wanted to wait until my camera came back from the repair shop so I could add more. Unfortunately my camera still isn’t fixed and who knows when I will see it again and it is really cramping my blog style! The table was covered with tree sap and dirt when we brought it home. After a little bit of elbow grease we used a hard bristle brush to give it a good cleaning. It was amazing what a difference it made. It looked okay at this natural state and Chris only had to give it a light sanding. 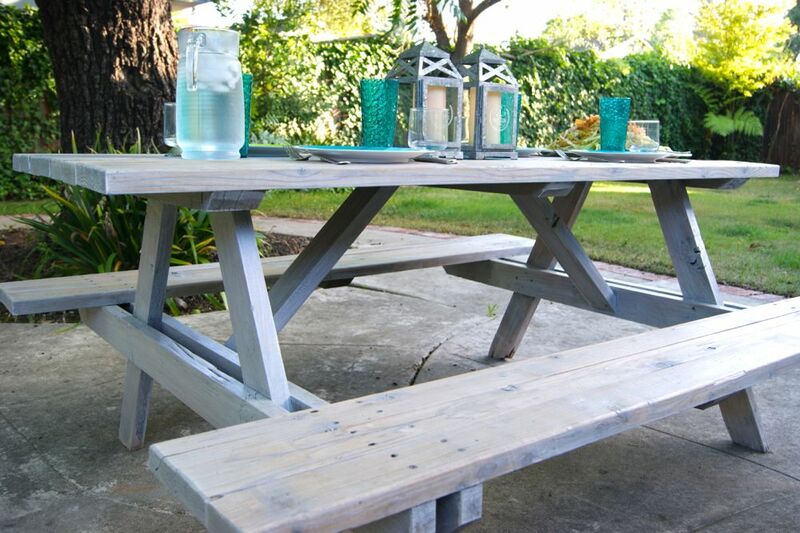 I love grays and blues so I chose Benjamin Moore’s Arborcoat in silver gray. It’s not the most dramatic makeover but I still love it. 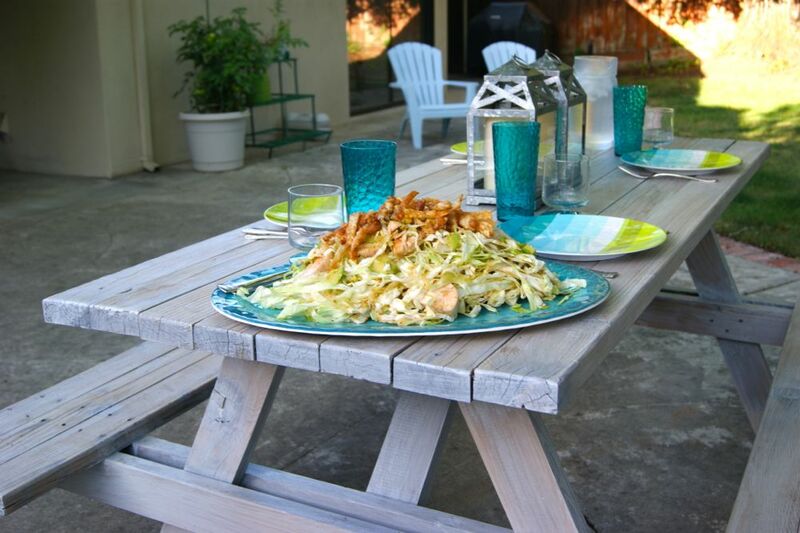 It has been great to have dinner outside and it gives us lots of seating for entertaining. I had a few friends over for dinner and I took a minute to snap some pictures of it set up. 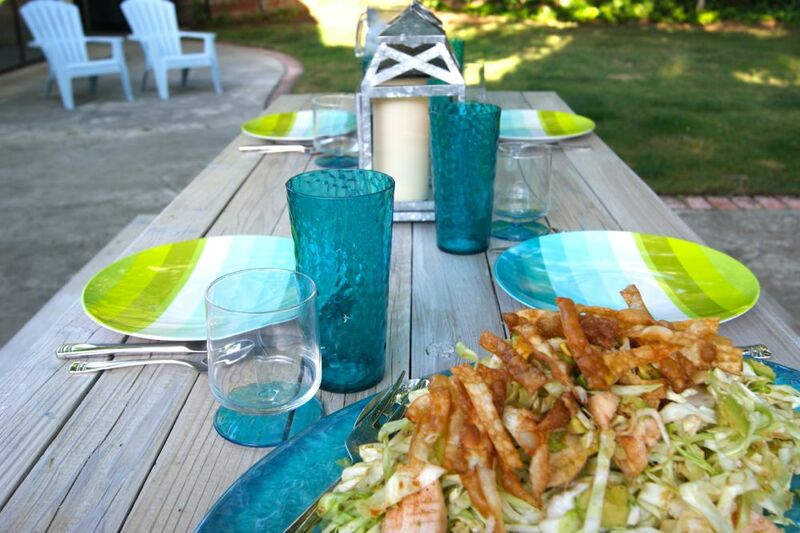 I made my Chinese chicken salad (the table looks empty in these shots but don’t worry, my guests had more to eat). 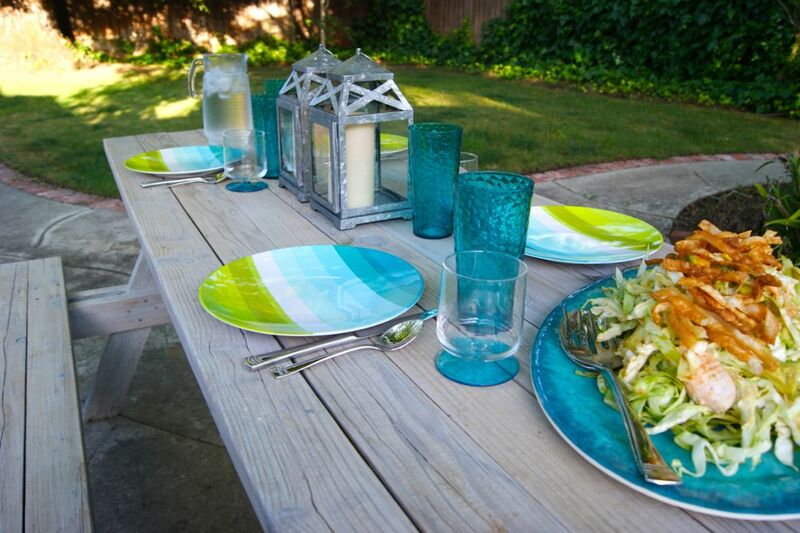 I found my outdoor patio dishes at Target, I chose colors that would tie into the rest of the colors outside. Our yard isn’t full of furniture and plants, just a few chaise lounges, comfy chairs, and a small herb garden but that works for us. Over the 6 years that we have been married we have moved around a lot so I guess we have learned to take it slow and add things little by little. 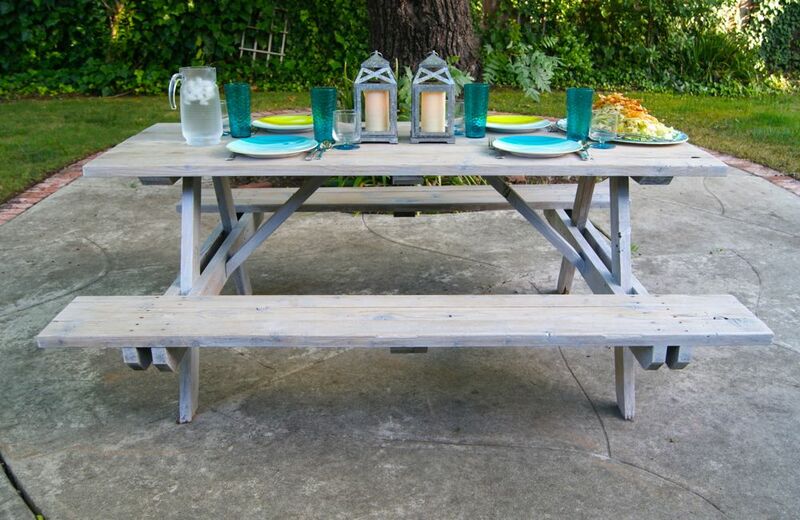 I really like the mission style of this table, much cuter than what they are currently selling at Home Depot. Still can’t believe this table was free! 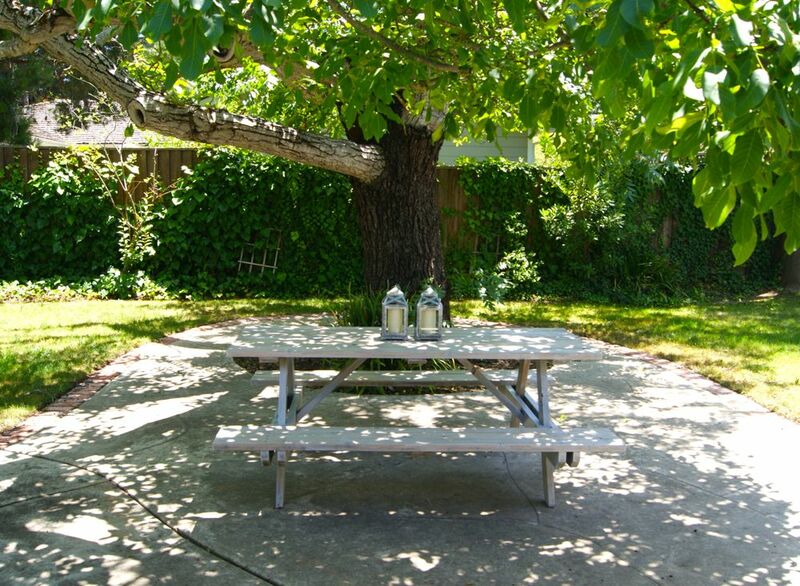 We have it placed under the large tree in our backyard, a nice shady spot. I have battery operated candles in the lanterns that turn on at dusk and it is nice to look out and see them lit up from our living room. 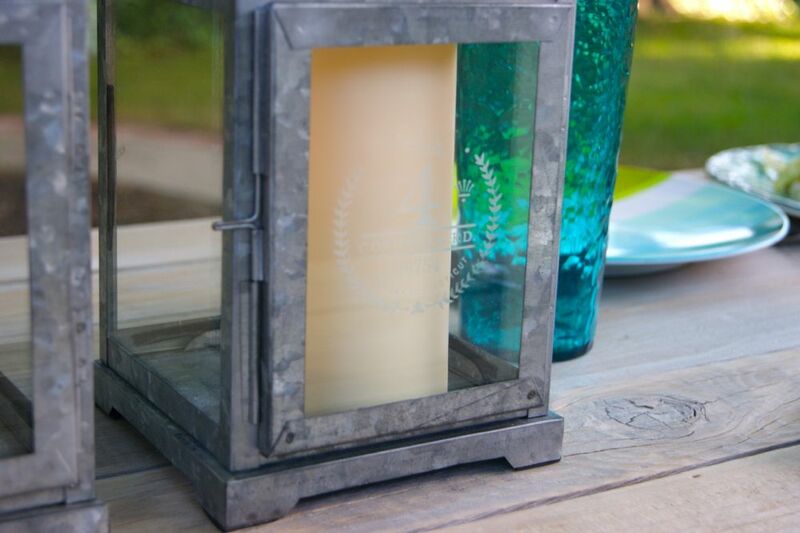 Something about candles makes our house feel like a home. I hope you like the table. Have a great week! 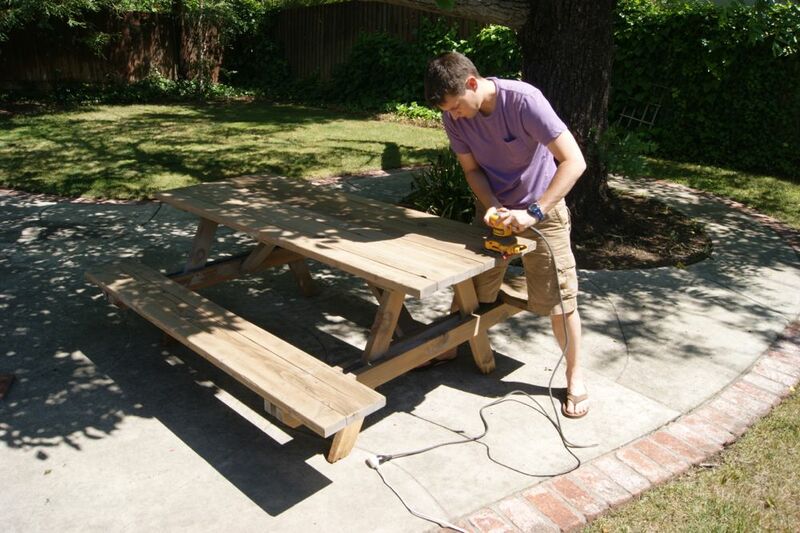 Great table makeover! I love the color! Looks great! Can't wait to dine on it soon!!!! Can't believe you will be here in 10 days, crazy! Looks great, Amanda, and I love the color! 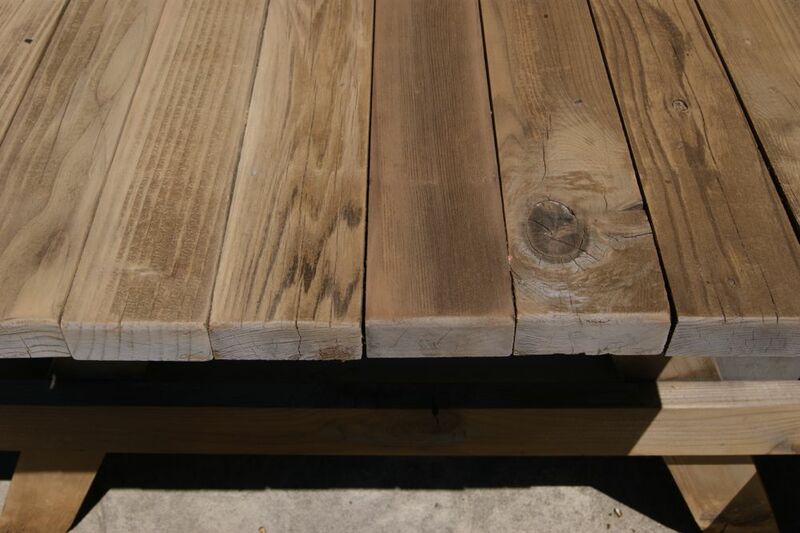 So cool that the Arborcoat is a color and sealer all in one. Thanks Kathy! Yes, I love the Arborcoat, I have been using it for other projects and it is so convenient. 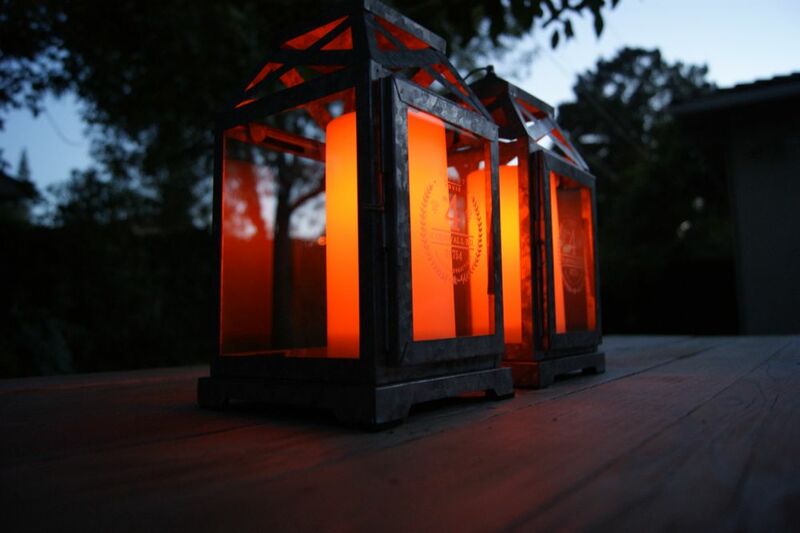 I love the lanterns with the candle timers. I'm sure your guests must have enjoyed that good looking salad. 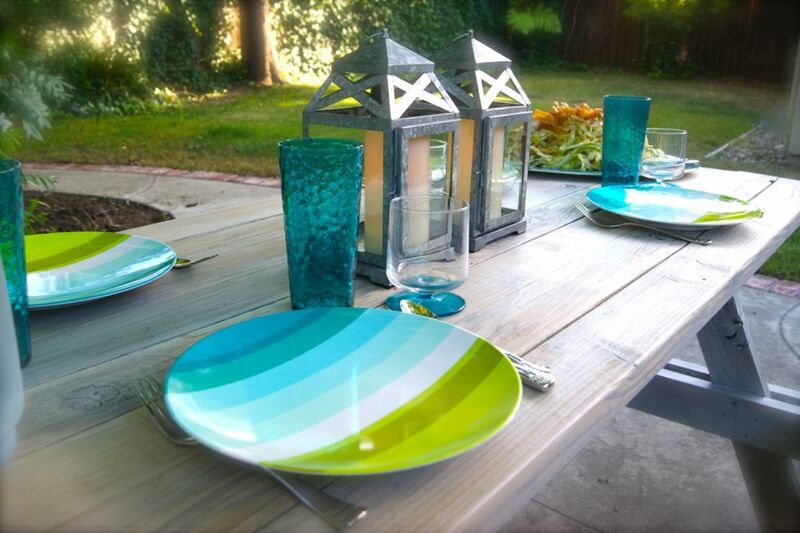 Very nice and the color on the table is perfect!!! And free you cant beat that. 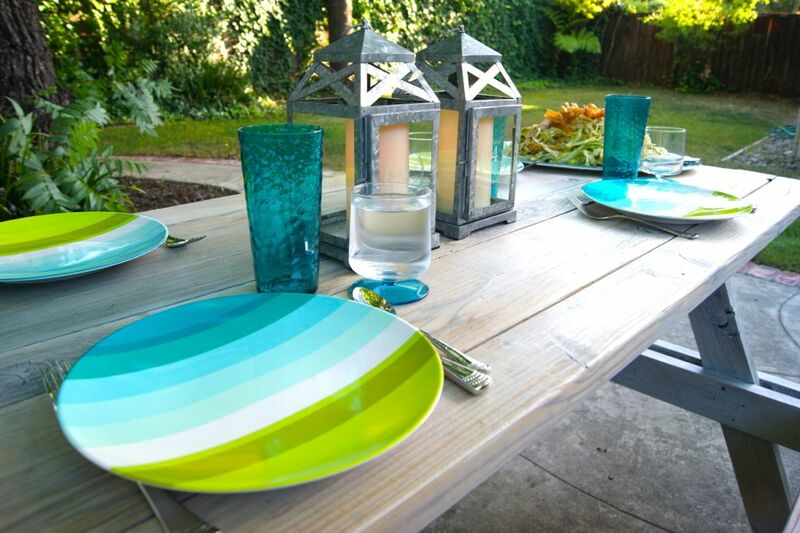 Love the rustic quality of the table next to your summer cool tableware! Thank you, I like the combo too. This is beautiful! Congrats on your awesome find and making it fabulous! that turned out absolutely fantastic. like a whole new table. 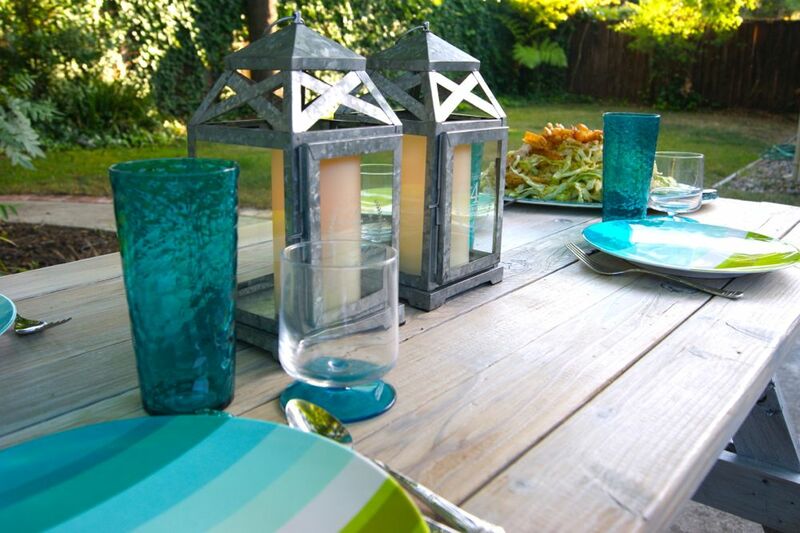 And I adore your table setting and lanterns so pretty. Amazing find. Seriously! You did a great job refinishing it as well. Thanks for linking up to Point of View! Hope you'll join us again next month! 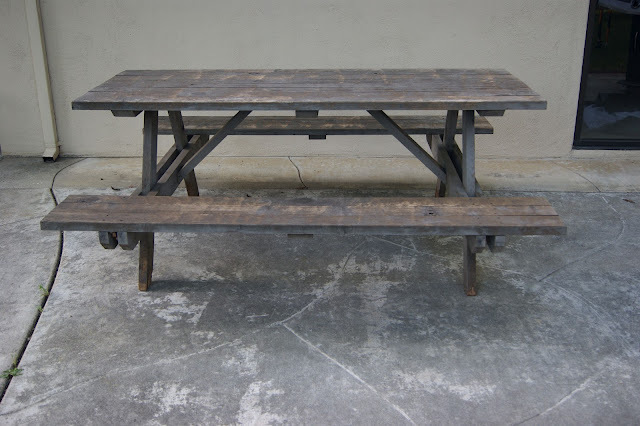 You have designed awesome picnic tables. Thank you for sharing this nice idea.